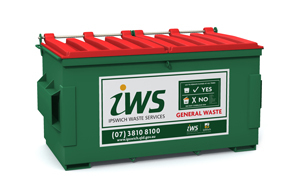 Ipswich Waste Services is a commercial business unit of Ipswich City Council. 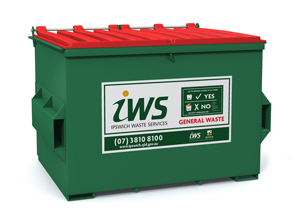 With over 50 years of experience delivering domestic and commercial waste services, Ipswich Waste Services has a strong background and is the only waste company in Queensland to be fully quality assured in all four areas of workplace health and safety, quality management, risk management and environment management. The team at Ipswich Waste Services is committed to providing the best possible service for our clients. We understand that every business is different and needs a waste management solution that suits its particular operations. Before commencing new services, we generally undertake a site visit to gain a full understanding of the needs of your business and any challenges that may be presented from the site. We then tailor a cost-effective waste management solution that meets the needs of the business. We deliver a wide range of commercial waste services to small, medium and large businesses across greater Ipswich. View our range of services below and contact Ipswich Waste Services for further information and pricing on the services listed. 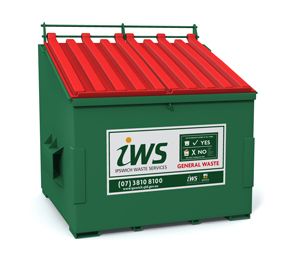 The Ipswich Waste Services front lift bins are most suited to generators of a regular volume of low-density waste. 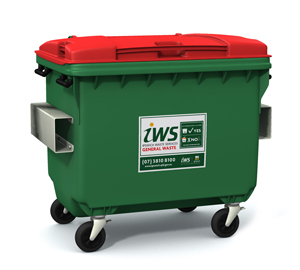 The bin is made of steel and is available in a range of sizes to suit all requirements. Collection frequency is flexible and can be arranged to suit customer's needs. Skips suit a wide range of applications and are ideal for non-compactable waste generated by building or demolition sites, large scale developments, garden or office clean ups and home renovations. Skip bins are available in a range of sizes to meet your requirements. Roll-on roll-off bins suit a wide range of applications. They are an ideal system for bulky non-compactable waste generated by commercial, building and or large scale developments through to office clean ups and home renovations. If you are generating a high volume of paper and cardboard, it may be financially viable to have an industrial cardboard bin at your business. You will also be helping the environment, as all paper and cardboard from the bins are taken to a paper mill for recycling. Much of the waste that is generated through offices and staff kitchens can be recycled. Implementing a workplace recycling program can significantly improve your organisation's environmental outcomes and can also reduce waste disposal costs. This service is ideal for organisations with large volumes of confidential documents, paperwork and other hard copies for destruction. Ipswich Waste Services provides an efficient and safe service to manage the collection, treatment and disposal of all types of pathological and related waste. All waste is disposed of in a local high temperature incinerator to ensure total destruction of micro-organisms and pathogens. We offer and provide a range of containers and will tailor the collection configuration and containers to suit your needs. Pathological waste containers range from 50L bins to 240L bins, so you can find one to perfectly match your requirements. A range of different sized sharps containers are also available. To make the service more affordable, we do not charge you extra for the disposal of these containers IF they are placed in one of our pathological waste bins. The high temperature incineration of your waste means there is no need to segregate sharps containers for disposal - saving you both money and time. On site compaction units are an economic and practical solution for companies or businesses that have limited space but generate high volumes of compactable waste. There are a range of sizes and configurations and the compactors can be built to your requirements. Compactors are an efficient, hygienic and practical waste disposal feature ideal for shopping centres, factories and other locations that generate high volumes of compactable waste.